Where can cities turn to support equitable development in struggling communities? Chances are there is a nearby university, college, community college or hospital willing to support a municipal agenda of job creation, housing and community development for distressed communities. Anchor institutions – hospitals, colleges/universities and other similar nonprofits – are large, place-based organizations that have a significant impact on the local economy. Anchor institutions make large real estate investments in their communities, attract an educated workforce and aren’t going anywhere when the economy takes a down-turn. “Eds and Meds,” as anchor institutions are coined by the University of Pennsylvania’s Netter Center for Community Partnerships, increasingly understand that their well-being is tied to the economic, cultural and community health of the cities they call home. In recent years, anchor institutions have torn down the town-gown wall that used to separate these institutions from their cities and have been the driving force of community-economic development on behalf of vulnerable communities and citizens in their domains. Bon Secours Hospital began systematic investment in Baltimore, Md.’s Sandtown-Winchester community, the hospital’s physical home and ironically the epi-center of rioting and unrest that rocked the city in 2015. 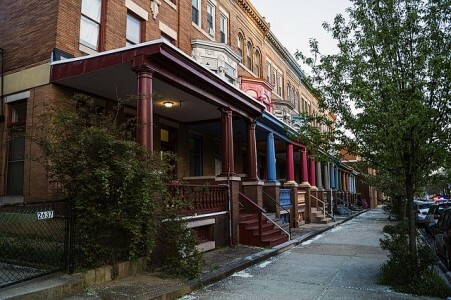 Historically Sandtown-Winchester was one of the nation’s thriving African-American middle class communities, the childhood home to Supreme Court Justice Thurgood Marshall and Billie Holiday. But in recent decades, the community has fallen on hard times with high unemployment and incarceration rates and low levels of home ownership and social mobility. Since 1997, Bon Secours has partnered with Unity Properties and currently manages 728 affordable housing units for both seniors and low-income residents in Sandtown-Winchester. The Bon Secours housing initiative has been hailed by the Department of Housing and Urban Development as a model of community development and now served as one of Baltimore’s most sizable and stable investments in a community that still has a long way to go in community revitalization. The U.S. Department of Housing and Urban (HUD) has placed high stakes on utilizing anchor institutions to support neighborhood revitalization through its Choice Neighborhood Revitalization Initiative. Since 2010, HUD has awarded 63 planning grants and 13 implementation grants to distressed communities across the U.S., not only to transform low-income housing but to improve the schools, civic, cultural and business opportunities in low-wealth communities. HUD requires an anchor institution to serve as part of the communitywide team in each neighborhood selected for the planning and implementation grants. Residents from low-wealth housing developments also serve on the team. In order to move forward to the implementation phase, a HUD community-team must demonstrate how they have leveraged HUD funding with other resources to develop community-driven solutions for improving the overall life of the community. Anchor institutions must identify specific commitments to their communities. HUD boasts that for every $1 of HUD funding allocated to the Neighborhoods Revitalization grants, communities leverage $7.50 of their own funding. The University of Chicago, the educational anchor institution in HUD’s Woodlawn-Chicago implementation grant, has expanded public schools instructional support and joint University of Chicago Police patrols in Woodlawn and other communities close to campus. More importantly however, The University of Chicago started investing its own resources to stabilize the Woodlawn area before federal funding. In 2003, The University initiated the Employee-Assisted Housing Program, with the goal of offering financial support to University employees who rent or purchase housing in the nearby Woodlawn community. The University provides up to $10,000 in forgivable loans for purchases in the Woodlawn community and lesser amounts for employees who purchase in other nearby, but less troubled communities. More than 240 University and University of Chicago Medical employees have participated in the program. The anchor institution doesn’t have to be extremely well funded – it just needs to be available with some level of fiscal and/or people resources in a community with needs the anchor can address. The investment can be as modest as North Carolina Central University’s (NCCU) strategic deployment of college students to serve as tutors in selected underperforming elementary schools or as comprehensive as John Hopkins University/Hospital System’s recent joint announcement of a $69 million initiative to expand employment, contracting and procurement opportunities for underserved communities and minority contractors in Baltimore. The Democracy Collaborative, with offices in Washington, D.C., and Cleveland, and the University of Pennsylvania’s Netter Center for Community Partnerships are two good places to start if your city is interested in finding and developing partnerships with local anchor institutions. The Netter Center has an excellent toolkit that can be downloaded at their site. Another alternative for finding a great community partner is to simply drive across town and locate institutions situated near the communities that most need support. Anchor institutions, city governments and residents all want the same thing – thriving, sustainable neighborhoods. Sometimes, all it takes is a simple conversation to turn things around in our most distressed communities.